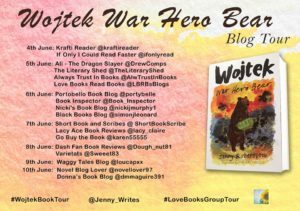 I’m delighted to welcome you to my review stop on the blog tour for Wojtek: War Hero Bear by Jenny Robertson and illustrated by Tim Archbold. Thank you to Kelly Lacey from Love Books Group Tours for the place on the tour and Birlinn Books for the review copy. 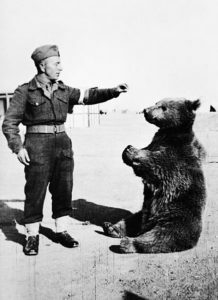 When a tiny orphaned bear cub is adopted by Polish soldiers during World War II, little does anyone know that little Wojtek will become one of the bravest fighters of them all. 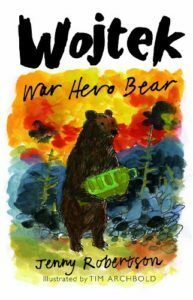 As the soldiers train to take part in some of the fiercest fighting of the war, Wojtek grows up, providing headaches and laughter in equal measure as he learns to drink beer, chase horses and wrestle with his human friends. But at Monte Cassino, as the Allies try and dislodge German troops from their mountain-top eyrie, Wojtek, now a fully signed-up solider with his own rank and number, comes into his own, dodging the bullets to carry ammunition to his comrades as they inch their way to victory. After the war, the Polish solders move to Scotland. Wojtek comes too and soon becomes the centre of attention in a new country. But with hostilities ended, how long can he keep his freedom? Best-selling children’s author Jenny Robertson explores the themes of friendship and trust in this moving and inspirational story. You too can read about Wojtek now in ebook and paperback. This is the most delightful tale, made all the more poignant by the fact that it’s based on a true story. It seems incredible to think that the events contained in this book could possibly have happened. Piotr was a Private in the Polish Army in World War II. One day he and his fellow soldiers came across a bear cub and decided to adopt him. They named him Wojtek. Eventually he was made a fully-fledged soldier in his own right and he started to be able to help out in various ways as part of the bid to win the war. Jenny Robertson has embellished the facts a little and added in various characters who didn’t really exist for the purposes of making a good story, but ultimately the bones of the story are the truth. Piotr cared deeply for Wojtek and the feeling was mutual, in fact Piotr was the only one who could control Wojtek. It’s such a charming and touching story of the little bear cub who grew up to be a fully grown bear of 2.13 metres tall. I laughed at the many times that Wotjek surprised somebody who was not expecting to meet a bear. They obviously ran for the hills but Wojtek was (mostly) a gentle giant. The lovely story is enhanced by the wonderful drawings by Tim Archbold which portray the life of Wojtek perfectly. Every chapter has one full page illustration. The book is aimed at the 9-12 age group. I think it would be perfect for children and adults alike. It is fairly gentle when covering the events of World War II but obviously adults can read between the lines. I wasn’t aware of what was going to happen at the end and it made me cry. I loved reading about Wojtek and his soldier comrades. He was a bit of a mischief maker, quite the performer, a bit feisty at times, but always loyal. Wojtek: War Hero Bear made me smile, it made me laugh and it moved me to tears. It’s a really lovely read. Jenny Robertson has written numerous books for children and adults – fiction, non-fiction and poetry. Her children’s novels and Bible stories have been widely translated and also read on Yorkshire Television and STV. Tim Archbold wrote and illustrated his first chilren’s book. In 1988 and since then has worked on books for a huge number of publishers, including Bloomsbury, HarperCollins, Macmillan and OUP. His illustrations have also featured in magazines such as Radio Times, Good Housekeeping, BBC Gardener’s World, Good Food and Country Living. Tim Archbold was born and brought up in Northumberland. As well as writing and illustrating children’s books, his work has appeared in the Radio Times, Good Housekeeping, BBC Gardener’s World, Good Food and Country Living; and he has worked with Hampton Court, Museum of London, Ashmolean Museum and National Maritime Museum Greenwich.